I am so full of hope – and it is exciting to be full of hope. I was diagnosed with Parkinson’s disease 10 months ago, and after that I felt like I had a black cloud hanging over my head. I didn’t know what my future was going to bring. Nothing I read about Parkinson’s disease made me feel upbeat or positive about my future. About a month ago I learned about Rock Steady Boxing through a friend. She introduced me to one of the boxers there – she was so excited to get me involved. So I walked into Rock Steady on that first day – a coach met me in the lobby and asked how she could help. I broke down crying and said, “I have Parkinson’s.” She hugged me and we sat down. By the time I left Rock Steady – I was already feeling so much better. Today, I have a new lease on life. I am upbeat, happy, and optimistic – I have HOPE. I have taken control of this disease. It is not controlling me. The workouts are tough – but I cannot wait to get here each day. The other boxers are so fun – there is lots of teasing and good-natured “harassment” in the gym. Most importantly, my family is so happy for me. I know it relieves their minds to see me so optimistic and happy… Our family room in our house has started to look like a gym. My husband is even hanging up a speed bag for me. I love to speed bag! My son came to observe me in class one day. 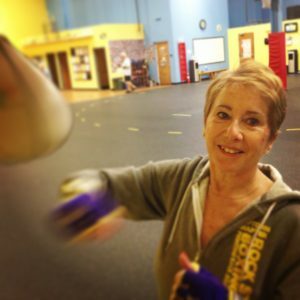 He said, “Mom, you were killing it on the speed bag.” Who would have ever thought a 71 year old woman would be starting a boxing career – and loving it so much?